Simon Starling’s exhibition at Camden Arts Centre is one of a curatorial nature, yet is diverse and unpredictable. The theme behind the exhibition is to bring together work exhibited over the gallery’s thirty year history. Modernist chairs sit on plinths alongside a Francis Bacon and Graham Gussin’s Fall (7200–1) (1998), which combines a computer randomly generating a continual stream of zeros it appears that apparently affect the footage of a waterside location projected opposite. In the next room Jacques Monory’s 1973 painting of a picnic labeled as including Christian Boltanski and himself taken from a 1970 photograph. Opposite this is Christian Boltanski‘s 1971 photograph Essai de Reconstitution d’un tableau de Jacques Monory, a photograph recreating the gathering depicted in the original image. 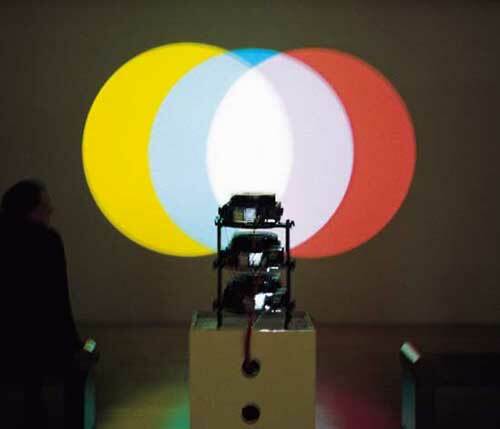 An exhibition of Susan Hiller‘s work opens shortly at Tate Britain but her 1987 slide projection entitled Magic Lantern is currently on display within this exhibition at Camden Arts Centre. Not being a familiar artist, however, it appears Hiller has worked in many media and I await the forthcoming exhibition to gain more insight into her practice. Magic Lantern, is a little slow showing just 12 slides from each of the three slide projects over a 13 minute show. However the slides are combined with an audio track based on the sound experiments of a Dr Raudive. This is a mixture of relaxing female voices chanting, as might perhaps be heard in a mosque, with messages with background noise that sound like old wireless recordings, which builds with the slide projection to create a trance like or hypnotic sensation. The slides themselves are very simple, each one contains a circle of pure colour, almost entirely the three primary colours. However Hiller’s combination of these creates a multicoloured light show. The three coloured circles are blended into one another in a kind of Venn diagram, faded in at constantly varying levels of intensity, hence blending coloured light like blending hues of pigment. In essence you could relate it to the scientific experiments with light; A level physics experiments with lasers and diffraction gratings spring to mind although that isn’t what this is. Dust and hairs collecting on the slides add to the work, giving it grain and texture that appears to protrude from the projection wall and further draw you into the hypnotic depth of the colour. Indeed the gallery’s navigational notes (Available from: http://www.camdenartscentre.org/file-uploads/File/FN-Starling-LOWRES.pdf, page 3) look to physics and time travel between objects; the exhibition is “Comprised of works that themselves push and pull at an understanding of linear time…”. The museum institution is a time machine that allows the viewer to hop between decades, centuries, countries, continents, and perhaps beyond. Patrick Keiller‘s Robinson in Space is at least predominantly filmed in London, moderately local to the gallery, whilst a map of the UK from the film is included as an exhibit, with a swirling route drawn on perhaps marking travel by sea, land and air. Meanwhile in the preceding room Harry Burton’s photographs document the 1923 excavation of Tutankhamun’s tomb many miles away in Egypt, some 3246 years old at that time (based on year of death at http://en.wikipedia.org/wiki/Tutankhamun). Chronology has been removed and we are lost in time and space. Philippe Parreno‘s exhibition at the Serpentine Gallery, meanwhile, is predominantly a series of films, but instead of allowing you to move between them as you please or be seated for individual screenings as at a cinema, Parreno directs the movement of the viewer from one screening to the next. As one film ends the blinds are electronically put up and the lights come on. You then begin to hear sounds from another room and as you enter it the blinds go down and the lights go out right on cue for the projection to begin. Like Hiller’s Magic Lantern, Parreno’s films focus upon the use of sounds, but where headphones are provided at Camden Arts Centre, Parreno’s sounds, which come from the action, echo around the building, including thundering rain and screaming children. Finally as the blinds go up in one of the rooms you discover it is snowing outside. At the time I visited it was dark so it was particularly confusing as to whether the weather had actually suddenly changed or this was part of the artwork, you simply lose control of reality. However, upon exiting, confused and now lacking Parreno’s direction, it became apparent that this is fake snow which falls from a snow machine on the roof on cue, and lays on just the patch of ground outside the window, under the glare of halogen floodlight illumination which also activates on time. How this work may have functioned during the snow we had in December is unclear. Additionally, in Parreno’s exhibition there are a series of sculptures around the edges of the rooms composed of copious amounts of international adapter plugs collected from just about every possible country and electrical system, which are stacked together haphazardly, converting a power supply continually until eventually in most places a comforting night-light uses the energy. These mark out the space in the darkness and stand like naturally formed cacti when the room is lit, pot plants around the edges of the room or perhaps, rather, weeds growing out of the cracks or gaps in the services channel. Simon Starling, Never the Same River (Possible Futures, Probable Pasts) runs until 20th February 2011 at Camden Arts Centre. Simon Starling also has an exhibition at Tate St Ives from 5th February to 2nd May. Susan Hiller opens at Tate Britain from 1st February to 15th May. Philippe Parreno runs at the Serpentine Gallery until 13th February.